AttributeMagic Free! 2.4 free download. Advanced utility to change date/time, attributes of files-folders, JPEG-EXIF images, MS Office document properties. Change Attributes is a plug-in for the program Useful File Utilities. DirDate is a command line tool that can easily be automated to change files last modification date, creation date or last access date. febooti fileTweak is a tool for all versions of Microsoft Windows (95/98/Me/NT/2000/XP) which allows you to change file attributes directly in Windows file property pages. Better File Attributes is a Windows Explorer enhancement tool that enables file dates to be changed at will. 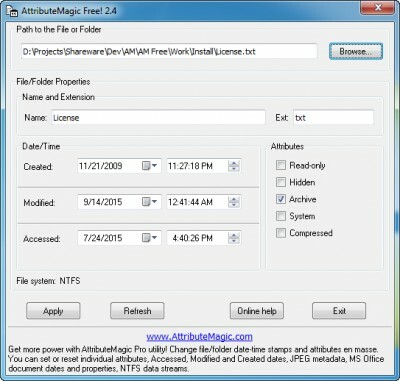 File Properties Changer is a computer program created to change properties of files, file name extensions, file attributes and the name of a file. EXIF Date Changer modifies the date and time attributes of the EXIF data in your digital photos. Magic Date Picker is a very easy-to-use utility for changing the date on your computer.